Be among the first to experience the excitement of the inaugural Perth International, Australia's richest golf tournament, with a range of exclusive and flexible travel packages from events and luxury travel specialists Events Worldwide. 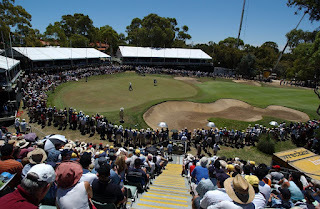 The stunning Lake Karrinyup Country Club will host what is set to become an iconic event on the Australian golfing calendar from 18 to 21 October 2012. With US$2million in prizemoney up for grabs, there's likely to be plenty of great golfing action from some of the world's best. The course is located close to the CBD so there are plenty of accommodation options available for a range of budgets. Packages include accommodation, daily event entry, daily course transfers, and more and can be can be tailor made to include flights, tours and airport transfers, day tours, plus an opportunity to also play a round at The Vines Resort & Country Club. Packages range from three nights (Friday, Saturday and Sunday night) to a seven-night golfing getaway, which includes entry to the practice day, Pro-Am and all four days of the tournament. Everyone who books the seven-day package has the chance to win a place in the Pro-Am with a pro! Three night packages start at $599 inc GST, five nights from $999 and seven nights from $1269. For a premium on-course experience, Events Worldwide also has available an 18th Green Marquee package hosted by golfing legend Ian Stanley. As well as the best views of the final hole, the package includes morning and afternoon teas, gourmet barbeque lunch, free flowing premium beers, wines and soft drinks, tea and coffee, car parking passes, official programs, general course pass, official pairing sheets, flat screen TVs and golf scoring terminals, air conditioned comfort and a private balcony overlooking the action. The 18th Green Marquee Package is available for $595 per person daily or $5950 per table of ten daily, (including GST). A Clubhouse Package includes guest appearances, three course fine dining at lunchtime, open bar, flat screen TVs, scoreboard and a viewing area at the 18th Green. This package is available as an upgrade to the Travel package for $395 per person daily inc GST. The Perth International is the only tournament in Australia this year to be co-sanctioned by both the PGA Tour of Australasia and the European Tour, ensuring there will be some of golf's best players in the draw. Lake Karrinyup is widely acknowledged as Western Australia's premier private golf club and has been regularly rated as one of the top ten golf courses in Australia. Events Worldwide Travel and Hospitality is the exclusive travel partner for the Perth International. For further details on travel packages visit www.events.com.au or call 1300 788 666 and for general event information visit www.perthinternational.com.